This tour is a full day visit to the impressive Sacred Valley of the Incas, covering the visits of the traditional Pisaq Market, Ollantaytambo archeological site and Chinchero colonial village and market. The second tour â€œmustâ€ of all Cusco visits after the City Tour. PISAQ : A small town visited by many tourists,has a very colorful market and an amazing inca architecture in the arqueological site. 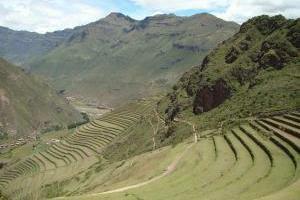 After the visit we'll continue to the archeological center of OLLANTAYTAMBO. OLLANTAYTAMBO : An archeological town with a very fine class of architecture,that can be seen from the entrance to the Main Square,with its narrow streets.